Our last Friday morning was especially colorful. 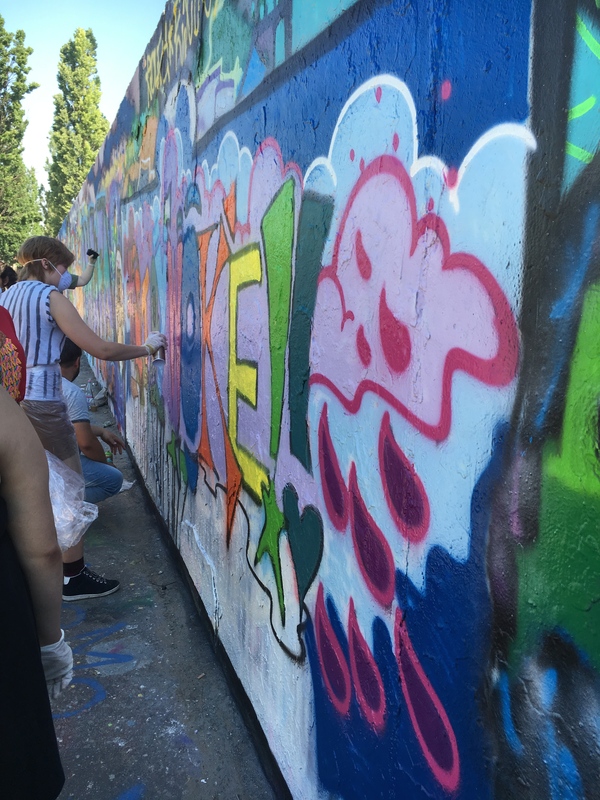 The FemGenuises met in a familiar setting, Mauerpark, for a Graffiti workshop with Berlin Massive. Our instructor, Pekor Gonzles, gave us a little history lesson before we began. Mauerpark translates to “Wall Park,” so called because the site was formerly part of the Berlin Wall, specifically its Death Strip. “Right here was where you got shot,” Gonzales recounted about the once heavily-guarded area. Today, the Mauerpark is one of the city’s green spaces, very popular with young people. We had experienced this for ourselves the Sunday before, lying in the field next to the Mauerpark Flea Market, where we saw lots of people our age laughing, playing basketball, and picnicking in the grass. Often, performers take advantage of the laid-back setting, and the amphitheater’s karaoke draws large crowds every Sunday afternoon. 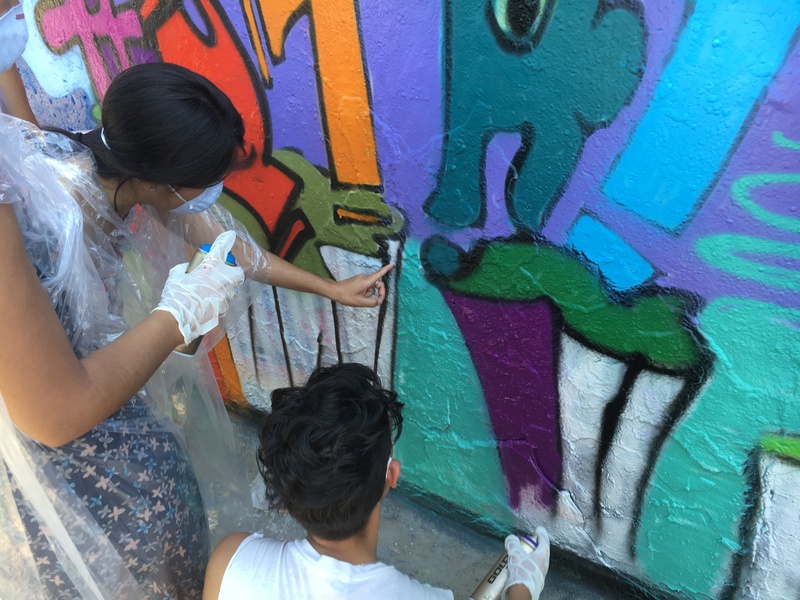 Because graffiti is largely anonymous, it can be used as a sort of secret code between the artist and her community. Thierry Noir is thought to be one of the first to do this, using the Berlin Wall as a canvas for his cartoonish creations. Influenced by classic painters such as Pablo Picasso, as well as pop-culture icons like Lou Reed and David Bowie, Noir left colorful, blocky images that represented the resistance to the dark shadows cast by the Cold War. Noir and Christophe-Emmanuel Bouchet began painting in April 1984 and continued without pause until “the fall” in November 1989. In “Thierry Noir: The First Graffiti Artist Fired Up by the Berlin Wall,” Jonathan Jones writes, “The end of the Wall in 1989 was a sunny day for humanity. But in its monstrous strangeness, this scar running through a city had provided artists, novelists, musicians and film-makers with a dark subject matter and surreal inspiration so often lacking in the safe, consumerist world of the postwar democracies.” Traces of his work are still visible at the East Side Gallery of the Wall. After hearing the history of street art in Berlin, it was thrilling to try it for ourselves. Gonzales gave us a brief tutorial on how to hold the cans of spray paint, and cloaked in protective ponchos, masks, and gloves, we went straight to work. Although I do think I improved by the end of the session, graffiti is much harder than it looks. Getting a clear, straight line requires a swift, steady hand that always knows exactly where to go next. Gonzales’ talent and style after years of experience was fascinating to watch. When showing us how to make a letter he drew a magnificent “S,” shrugged and said, “This is just the classic kind of flourish an artist would add to a letter, but I’m sure you can get more creative than that.” Afterwards, he outlined the entire background in thirty seconds. Each of us had our own letter to design and lots of background to fill in. Without trying, our piece came together as a rainbow of color. 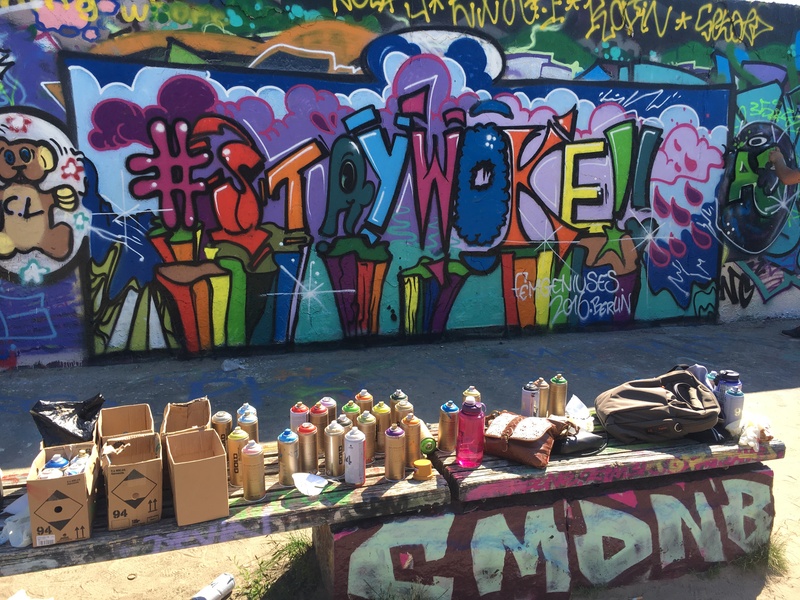 For our design, the FemGeniuses semi-ironically decided to paint the phrase “Stay Woke” adorned with a hash tag and two large exclamation points to give each student their own letter or symbol to paint. Behind the rainbow letters are purple clouds and rain, a tribute to Prince, who died this past April. His legacy as a musician, defying traditional conventions of race, gender, and sexuality, is one we were all excited to honor. Underneath the clouds are pieces of a broken island with the ground underneath revealed to be multi-colored. We never discussed the exact symbolism of the piece, but it lends itself to the interpretation of the passer-by. On either side are the designs of Chase and AJ Lewis, two emerging artists with very different styles. The design turned out beautifully, in large part thanks to Pekor’s finishing touches, and we were all in awe of the result. To think, the FemGeniuses of 2016 have our own section of the Berlin Wall! By next year, the message will be entirely painted over but the layers of paint remain a part of the wall itself along with so many others. and proudly turning in the first blog post I’ve ever written. Having met so many brave, intelligent, passionate people in the last few weeks, I am inspired to try to be more heroic in my own life. On this trip I’ve learned that fighting oppression requires determination and the ability to think critically about one’s society but most of all it requires heart. Building communities out of compassion and empathy is essential for the well-being of humanity and ourselves. 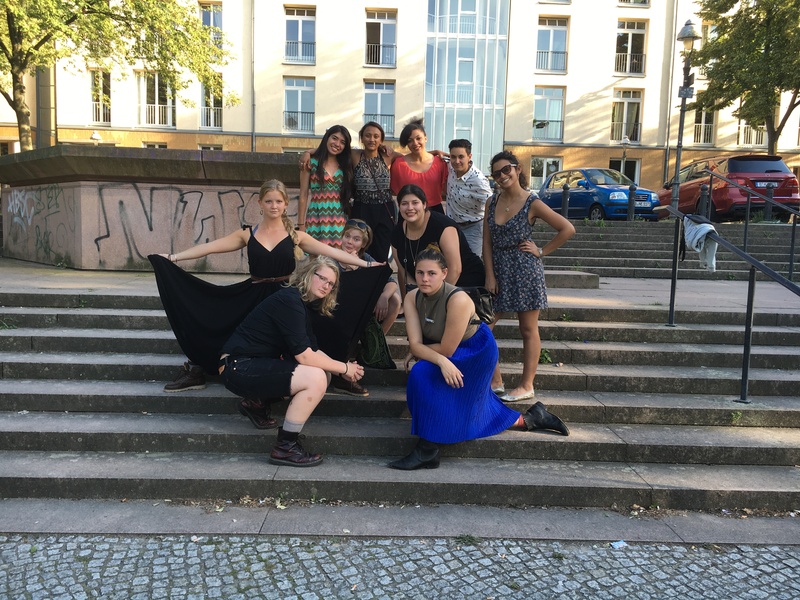 I leave Berlin knowing that my experiences here and the people I’ve made connections with will fuel a lifetime of activism. Also, click here to view a slideshow of the course. 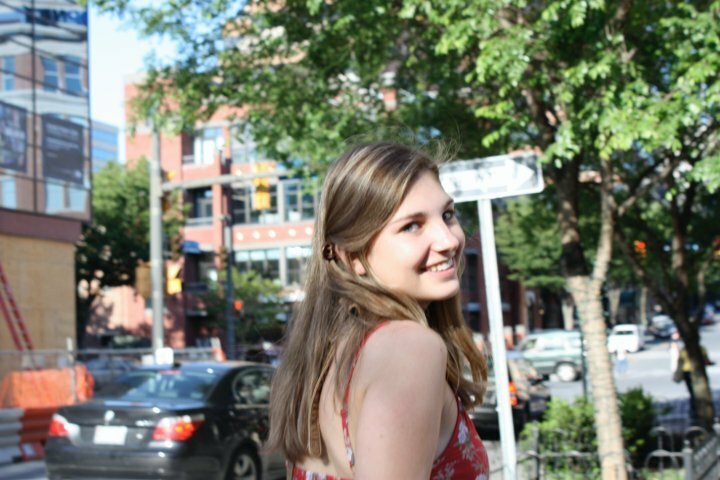 Claudia Harrison is a senior Classics–History–Politics major from Washington, D.C. Her second day of college, she decided to spend the next four years trying to understand all of human history and thought. While she’s still actively failing at this task, she believes taking her first Feminist and Gender Studies class this summer may be a step in the right direction. In her free time, she can be found reading obsessively, over-analyzing TV shows, and boring her friends with useless facts about everything.